Located near the Luigi Cazzavilan Park, at the Green Frog Hostel in Bucharest you can feel and breath the scent of passed times and enjoy the atmosphere of the"Paris from the East" as our city used to be called in the past. Green Frog Hostel offers a clean bed, a clean shower, water, laundry, tea, coffee and a decent breakfast and a friendly staff. 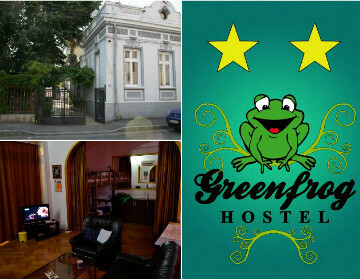 Bucharest Tips team has reviewd Green Frog Hostel - Hostels in Bucharest. You can get here description, reviews, address, map, phone, website of Green Frog Hostel in Bucharest. Visit Buchareset Tips for more Hostels in Bucharest!